Description: Contains a mix of picture strips and stories amounting to a combined total of 20. 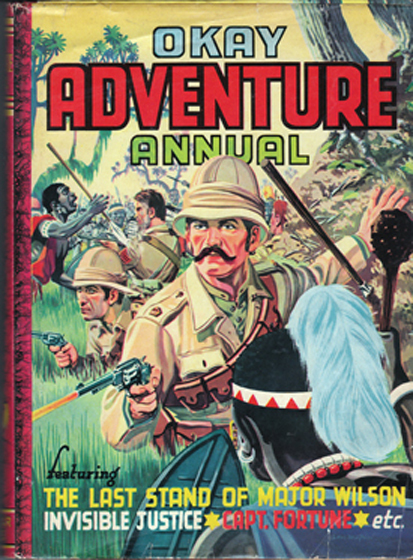 Stories and strips illustrated in black and white or full-colour. The first story, Raiders of Busangar, features exceptional colour illustrations by H. Johns. Several superb full-page B&W illustrations by D. McLoughlin in the title story, The Last Stand of Major Wilson. Stories range from contemporary adventures to those set in the Middle Ages. Inner front and rear boards contain an illustration of a jousting tournament (in full colour at the front and B&W at the rear) by McLoughlin. No year of publication given, but believed to date from 1955. The dust jacket is in almost perfect condition. Its only defects are slight rubbing along the top and bottom of the spine; one 5 mm and one 0.4″ (1 cm) tear at the front; and one 4 mm tear and one 0.4″ × 0.2″ (1 cm × 0.5 cm) loss at rear. Superb colour illustrations by D. McLoughlin to front and rear. Rear cover depicts an African warrior standing atop a rock. Pages are tanned, but free from foxing or markings of any kind – except for the "This Book Belongs To" panel, which contains a dedication in blue ink. Measures 10.2″ × 7.6″ (25.5 cm × 19 cm). 4to. 141 pp.